A good friend of mine recently posted a request for ideas for summer fun if you don't plan to send your kids to summer camp. I started thinking about the fun things my mama did when we were kids and what kinds of things I want to do with Abigail now. I have fond memories of our summers, and we never went to camp and rarely went to amusement parks. I clearly remember summer being a wide stretch of time to just relax and be after a busy school year. I believe that kids should be outside as much as possible especially after months spent inside a school building. Fresh air is good for you, and interacting with nature builds gray matter (that's the brain, in case you've spent too much time inside). Many of these activities can be done sitting on the back porch or on a blanket out in the yard. If you don't already have a pool or a membership to a pool, get a small kiddie pool just to splash in. For small babies, an ice bucket can work (I got one on clearance at a department store for my 18 month old last year). I grew up with the molded plastic ones that are $5-10, but the blow-up kinds are lots of fun too. A lot of parks now have water features for kids. I'm a little hesitant to go to the fountains at public parks because of sanitation concerns (but mostly because they're so far from my house), but use your own judgement. I plan to go to the splash park at the Louisville Zoo almost weekly this summer though (water spouts, water slides, dunking buckets). Check your local listings for something similar. Get a family membership to a local attraction that you'll enjoy once a week or so. Does your area have a zoo, science museum, wild animal park? A lot of attractions have education departments that plan kids activities throughout the summer. Take proximity and your family's interests into account, and join. Grab a copy of your local library and bookstore's activities calendars and plan to attend several children's events. I used to bulk up our children's activities during the summer when I was the activities director at a bookstore. Most bookstores and libraries will also have a summer reading program with free gifts for reading a certain number of books. I think summer reading is important enough to list twice. My school didn't have a summer reading program when I was growing up, but I took it as a personal challenge to read lots of books during the summer. Many schools now require kids to read a certain number of books or certain titles before returning to schools. While I think it's important to keep kids engaged in education during the summer, it could be frustrating for a child to know they have homework during the break. Personally, I used to make a list of books that I thought sounded interesting and tried to make it through all my titles before school started. If I got distracted and found something else interesting, that was ok too. I always kept a list of the books that I'd read during the summer. Summer is a great time to get free reading done when there isn't a lot of homework and after school activities to take up time. Stock up on craft ideas and supplies. There are lots of great craft books out there (check the sidebar for a few), and craft stores have entire aisles devoted to summer crafts for kids. Plan one day a week to do arts and crafts with your kids. Have a "learn something new" summer. Have each child choose a topic to research and become an expert on. When we were kids, one of my brothers decided to learn more about primitive living and it ended up influencing the course of his life. (Incidentally, this was inspired by a book that he read and enjoyed: My Side of the Mountain by Jean Craighead George). Put on a play, a puppet show or film a movie. Decide as a family how to divide the roles. Will each person have a different job (writing, directing, designing costumes and props) or will it all be a group effort? Make sure to invite friends and family to view the performance (if you do a play or puppet show try to record it - what fun to watch again in a few years!). If you prefer not to write your own story, there a lot of skit books available for kids. Design a treasure hunt or a mystery for the kids to solve. This can be pretty tricky, but so much fun. The kids can even design the treasure before you hide it as part of craft time. Be a tourist in your hometown. Explore inexpensive (or free) landmarks that make your home unique. We live not far from Abraham Lincoln's birthplace, but in the nearly ten years I've lived here we still haven't visited! Make a travelogue scrapbook/photo album of your favorite places, and include descriptions of why you enjoyed the visit. Build a fort, hideout, clubhouse or playhouse as a family. There are lots of books available with plans, but it doesn't even have to be that hard. My youngest brother build at least two forts when we were kids, one using leftovers from a local builder (be sure to ask permission for the supplies!) and another using limbs and sticks found on the ground and a box of nails. A friend and I once designed a hideout using a bale of hay (although that got itchy around August). Use your imagination. The less you buy for this project, the better. Check out the movie The War for inspiration (an early Elijah Wood movie, I recommend it for pre-teens, and you may want to review it first - it's pretty intense at times). Start a small garden. We built a small raised bed for about $20 (lumber, soil and seeds) to grow carrots in for our daughter. It's so important for our future generations to know that food comes from the ground and not the grocery store, and that food means vegetables and not Twinkies. You can talk to your kids about the victory gardens during World War II, or about self-sufficiency and independence (there's nothing more independent than growing your own food). Make sure to build in "free time" for climbing trees, reading, exploring and just being a kid. These are just a few of my ideas for summer fun. I tried to make sure they were suitable for most age groups. What fun things do you plan to do with your kids this summer? Did you know that May 15 is National Chocolate Chip Cookie Day? I love chocolate chip cookies, especially my mama's secret recipe. I'm a big fan of very flat cookies with the chocolate chips making lumps. It's funny, my youngest brother and I both use Mama's recipe, but out cookies turn our completely different (he likes his cookies with some substance). I plan to celebrate with a big batch of chocolate chip cookies. When they come out of the oven, and have been removed from the pan, I'll yell out "Hot cookies!" and my husband and daughter will come running for a treat. My mother-in-law did this when her children were young, and I learned early on that my husband expected to be told when he could eat the cookies. I know my sister-in-law uses this tradition with her children too, and I think it's fun to see it get passed along to the next generation. What's your favorite chocolate chip cookie recipe? How will you celebrate? Check this out for more ideas and recipes. Edited to Add: I have learned that today is actually National Chocolate Chip Day (see title) but it seems that when I see the words "chocolate chips" my brain automatically fills in with "cookie." Not necessarily a bad thing, but embarrassing when I realize it nonetheless. I still thinks we'll celebrate with cookies though. Yes, I know I'm behind. I'm okay with that. I hope every mother had a wonderful day. I woke up with a happy two year old yesterday (I'm not always sure about that), got to take a long shower (alone! ), and enjoyed a simple family day. A blood orange based smoothie/juice for breakfast, grilled hamburgers and grilled asparagus al fresco for lunch (I LOVE eating outside), and grilled steak and sauteed asparagus for dinner. My husband presented me with a sweet gift of a framed photo of our daughter that I took last fall, and then hung several photos in our living room for me. Now I need to think of fabulous things to do for Father's Day. I am on the lookout for Mother's Day gift ideas for next year for our moms and my grandma. Since Abigail was born, all of our gifts have revolved around her. The first year it was photo mugs (from snapfish or shutterfly - very easy) and last year was photo coasters (also from one of those sites). This year, we decided to send a memory card containing lots of pictures for our moms' digital frames (my mom can use it in her mp3 player, too). Both moms enjoyed having lots of new photos since they live far away. I had hoped to make aprons or purses, but didn't make it. Maybe next year. What kinds of things do you do for your mom now that your an adult? Does you mother's day gift to her always involve your child? I know that our moms appreciate receiving things about and from our daughter, but I can't help but wonder if I should do more than this? Any thoughts? 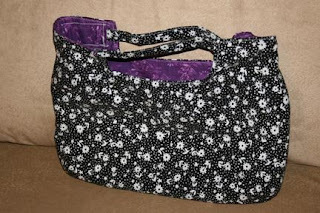 My second sewing project was also from Bend the Rules Sewing. I loved the receiving blanket pattern, and went a little crazy buying flannel on sale. (The project calls for a yard of 2 complimentary fabrics and a layer of flannel in between, but a variation is 2 complimentary flannels.) 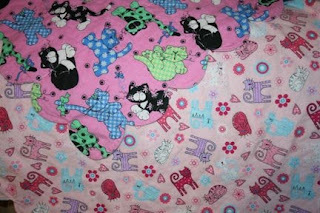 This blanket is made of 2 pink kitty prints. My daughter loves cats, and I already had one of the prints at home. So I just found another pink kitty to go with it. Since the blanket doesn't use the whole yard, I also made a matching doll diaper and doll bib. She got the blanket, diaper and bib for Christmas. I wasn't able to put the Velcro closures on before I wrapped them, though. I'm so slow that I still haven't finished them! Abigail loves this blanket. It goes almost everywhere with us, and her babies get wrapped in it a lot. It also makes a great nursing cover (during winter and spring anyway). I'm trying to find fun fabric to use this summer to make a lightweight blanket that she'll enjoy too.